The White Rim is the best dirt-road tour in Utah. And maybe anywhere. Located almost entirely within Canyonlands National Park, it is peppered with amazing scenery—remote box canyons, precarious towers, and illogical sandstone formations—and is, in my opinion, the very best method for exploring the Park. As awe-inspiring as Grandview Point is, nothing compares to actually submersing oneself into the depths of the canyon country—human powered, quick, silent, and rewarding. You will see more in one day on your bike, than you could in a lifetime staring down from the viewpoint above. The White Rim has a reputation for being an ‘easy’ 100 mile ride. Easy? Compared to what? 100 miles is still 100 miles. That several of those miles are smooth dirt road does not mean that there are not still miles and miles of rugged, primitive, rough terrain—along with nearly 7,500 feet of elevation gain. The White Rim is a mountain bike route. Leave your ‘cross or touring bikes at home. Full-suspension is perfectly appropriate, and appreciated. However, the White Rim is an ideal 100 mile route for the first-time off-road centurion. There is very little technical (by Moab standards) riding, and the navigation is as straightforward as can be. None of the climbs are longer than the Shafer Switchbacks, which, if you are a first-timer, ought to be ridden down. That is, ride the loop clockwise. Hundreds of people ride the White Rim each year. Many of them ride the entire loop in just one day. It won’t be easy, but as far as off-road 100 milers are concerned, it can be one of the most beginner friendly. This seems self-explanatory, but needs saying anyway: know the route. Search for trip reports, blog posts, or forum threads about riding the White Rim in a day. Look at a map before the ride. Memorize the names of landmarks. This is really easy on the White Rim. Every 15-20 miles there is a campground with a toilet. The toilets are all very visible—and labeled. They are an easy way to mark your progress, especially if you have made notes, or memorized the general mileage markers of each campground. For example, if you start the ride at the entrance gate to the Park, and ride clockwise, the Gooseberry campsite is about 30 miles into the route. The Park has free maps at the visitors center, as well as a PDF version. If you have a GPS, download the .gpx file. It’s almost impossible to get lost*. With the exception of Potash Road, which intersects the White Rim Road at the bottom of the Shafer Switchbacks (and leads into Moab), there are no intersecting roads that lead anywhere. They each dead end at a campsite, or a boat launch within a mile or two. However, knowing the route, and knowing where you are on the route, is a vital part of a successful and enjoyable trip around the White Rim. *It’s not my fault if you get lost. If you are considering the White Rim in a Day, then you are probably a mountain biker. Which means, you have some level of experience and fitness. The White Rim will challenge whatever those leves are. 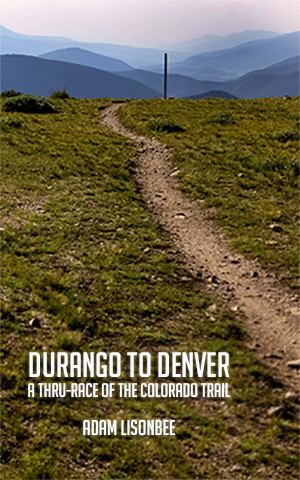 Even well-traveled riders have difficulty finishing the route. An unexpected bonk, mechanical problem, or weather event can fundamentally change the nature of the route. 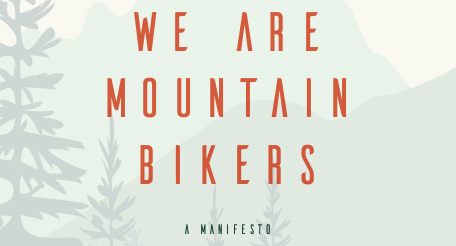 If spending 8-12 hours in the saddle, in remote terrain, is not something you have done, you might want to consider a few preliminary rides. At the very least, ride the White Rim with a support vehicle. If you are ready for a self-supported—you carry all your gear, food, and tools—attempt, just keep in mind that once you descend into the bowels of the Rim, there is no easy way out. The White Rim has no shortcuts, bailouts, water, convience stores, or anything else. Cell phone coverage is non-existant. It’s as empty as can be. And while it’s common to encounter other riders, don’t count on them being able or willing to offer assistance. 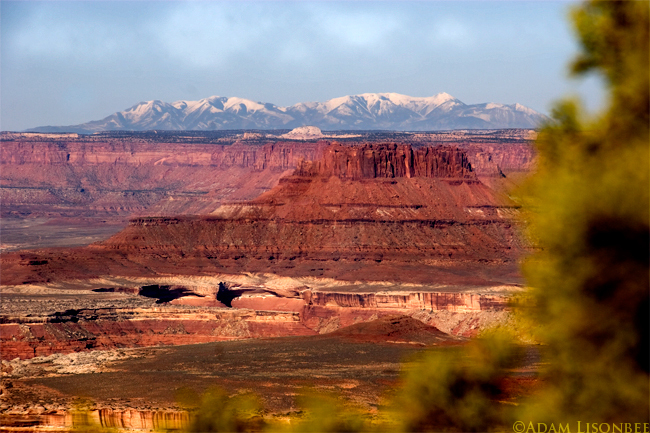 The ideal time to ride the White Rim is in the spring or fall. The temperatures will be cooler. Leading up to the ride, watch the weather in the area. Has it been raining? Windy? Unseasonably hot or cold? If rain is in the area, bring rain gear. If the days have been hotter than normal, or just warmer than what you are currently acclimated to, bring more fluid than you think you will need. This is easy if you have a support vehicle. If not, then prepare to carry 150-200 oz. of fluid. ** Bring a cycling computer or GPS. The White Rim is monotonous and vast, and it can be difficult to know how long or how far you’ve been riding without a clock and odometer. Start early. Carry a headlamp. Keep moving. 100 miles is a long way to pedal a bike. **You might need more, you might need less. Exactly where to begin (and which direction to ride) pedaling the loop can change the ride significantly. My favorite is this: Park a vehicle in the dirt parking lot at the end of Mineral Bottom Road (about 13 miles from Highway 313), at the top of the Horsethief Switchbacks, and ride the loop clockwise. This will allow you to ride the brain-numbing Mineral Bottom Road, and Highway 313 pavement early in the ride. In this direction you will also pass through the Park entrance, so bring $5 per rider for your day pass. A clockwise loop will send you down Shafer Road, rather than up it at mile 80. Riding clockwise also means that you will climb the shorter (if steeper) sides of Murphy’s Hogsback and Hardscrabble. The final climb of the day, Horsethief, will come at mile 99. It is a rewarding way to finish out your day. The White Rim is one of my favorite rides. I love riding in the open, immense landscape and seeing again the familiar towers and canyons and blackbrush. I’ve ridden the loop 6 times in the last 4 years. Nevertheless, each time I see something new, and learn a little more about the area. It is beautiful and terrible and wonderful. Ride it. In a day. With friends, or solo, as a TT, or as a liesure social ride. But be prepared, and understand what you are getting yourself into. Either way, you will never forget your first Ride Around the White Rim in One Day. Official NPS White Rim Road Page. Detailed Description of the White Rim at Utah Trails. Thanks for posting this Adam! 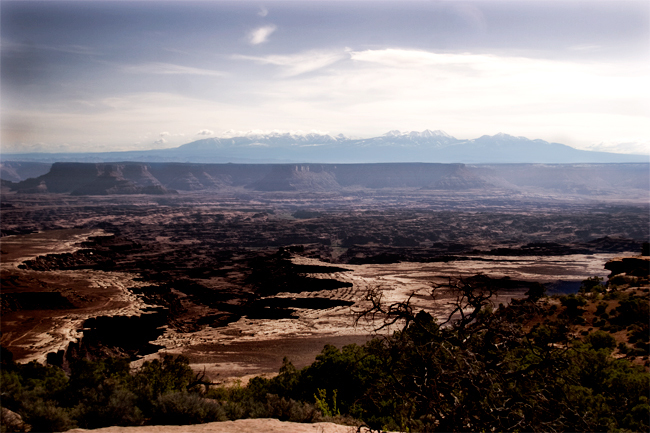 I have never ridden the White Rim but I really want to ride it ASAP…hopefully this spring before it gets too hot. Nice report. Again, I wish I could have been there. I’ve only ridden it once and have been craving it ever since. Need to go back! Great write-up. I disagree on only one point: direction. I swear it is easier counter-clockwise. No one ever believes me, but I swear it’s true. Start at the bottom of Shafer before dawn with a small LED headlamp. Before you know it you’re up top, just as it’s getting light. You fly down the Mineral Road going CCW, averaging ~25MPH. Hardscrabble is way easier CCW. Murphy is way easier going CCW. After the White Crack junction, you zip along for miles at 25MPH+. Oh, and I’ve experienced at least one additional hazard you didn’t cover. But yeah, great post. What was the additional hazard? CCW has it’s advantages. In some ways I like it better. You get all the climbing done earlier (other than Shafer), but sometimes the Candlestick area leading up to Murphy’s can be pretty soft. That sand is easier going CW/downhill. But if the sand is minimal… then that can be a fast section. Last year I rode CCW, starting at the Mineral/313 junction, and had a PR TT. Nice write up. One of these days if I invest in a MTB I’ll ride that thing. That seems to be too long as publicly available garmin data I found has moving times of 8:26, 10:04, 9:30. Does anyone know someone who did it in less than 8 hours? Also, satellite maps show that the trail goes close to the Green River somewhere across from Holeman Spring Basin and Steer Mesa. Is using a water purifier or filter an option for a refill of the CamelBak before the final stretch?